What an amazing Super Bowl that was. All the elements, all the items really came together. Most of all, what an insane ending! I mean, I knew there'd be the meat and the tortillas, and cheese, but who would have thought there'd be a hidden cache of black beans underneath everything? Oh, I'm not actually talking about the Super Bowl game—because really, who cares? Some watch for the commercials, some watch for the game (a very small some), but I watch, because I know wherever I'm viewing, there's going to be condiments. There's going to be nachos. But not just any nachos, nachos so super, I needed to put them into a bowl. A Super Bowl. actually have any, so my metaphor holds true. I realize most people don't put nachos into a bowl, no matter how super they may be. They claim it's strictly a platter entree. Well to them I say, I'm just being clever... oh, and they aren't allowed to have any of my nachos—which are super good. Nachos, by definition, will rock. All of the base elements are deliciously super on their own, but when combined together, we approach flavor nirvana. As long as a plate (ermmm, bowl) incorporates, at the very least, tortilla chips and cheese, you have nachos. Everything else that gets added just piles on and makes for even more taste sensations. You like jalapenos? Add em. Salsa? Go ahead? Pulled pork? Why not! It's extremely adaptable as a meal. My Super Bowl had all of the above and more. One bar I go to even features what they call “Irish Nachos”--traditional nacho toppings, except they're served over a bread of waffle french fries. While this does go against my previous statement of combining tortilla chips and cheese, the taste more than makes up for the difference. They taste as amazing as they sound. The one downfall of nachos is people occasionally like to put black olives on them. Or as I referred to them in the opening paragraph “The hags.” See, you thought I was talking about Madonna, but note, I didn't have “Old” in the front of it. I thought most people realized olives were like miniature hockey pucks (but with a hole in the center and a worse taste) and wouldn't dream of ruining a batch of flavor perfection with their inclusion. The only logical conclusion is there must be some sort of nacho curse and they must be included. Which I can deal with—at least the nacho overlords didn't dictate it needed to be mushrooms. 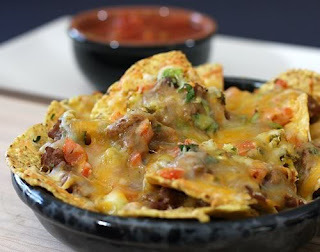 Really the only way to improve upon nachos is if you take all the ingredients and blend them up into some sort of slurry. That way you can just drink the product and not have to worry about getting spicy salsa into any sort of open cut or lesion you might have on your hands. But until we get blending technology capable of achieving that feat, I will continue enjoying the superest of snacks, my Super Bowl of Nachos.